One year has passed since the Pevensie children have returned from the events of Prince Caspian. Edmund and Lucy are staying with their rather unpleasant cousin Eustace Scrubb when all three are suddenly swept into Narnia. Landing in the middle of a sea, Caspian saves them and brings them aboard his ship The Dawn Treader. 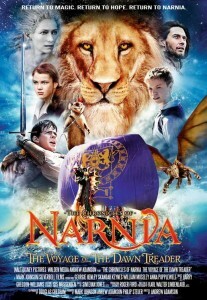 In Narnia, three years have passed since Caspian became king. Now, assured things are under control at home, he has set off on a quest to find the seven missing lords of Narnia, displaced when Caspian’s uncle sat on the throne. They soon land at the Lone Islands where, they find the first missing lord, but discover a mysterious mist terrorizing the citizens. In addition to finding the missing lords, Caspian and the crew now look to save those taken by the mist – a feat they can accomplish only by locating the seven swords of the seven missing lords and laying them at Aslan’s table. Anyone who has read the book will find elements of the above summary a surprise. Expect changes. While most of film’s events are drawn from the story, the way in which the screenwriter weaves them together to fit the film’s two-hour run-time differs in many respects from the book. Fans of the series will know there is a lot of plot squeezed into this book, so alterations for the big-screen were no doubt unavoidable. That said, a fair bit of the story makes it into the film, but even this has drawbacks. The audience begins to feel Lucy, Edmund and the gang have barely arrived at one part of their adventure before they are plunged head-long into the next. In the same way, some of the dialogue feels compressed; characters sometimes come to the point a too quickly, without the gradual development of thought that would make them more believable. Yet, despite these flaws, the film is a joy to watch. The excitement of enchantments, dragons and swordplay balances well with the deeper truths explored in the story, primary among them the truth that people cannot, by their own strength, overcome trials and temptations. All people, no matter how valiant, need the help of someone greater than them. Lucy struggles with her self-worth, Edmund thirsts for power, and Eustace is greedy for material gain. Without the intervention of Aslan, any of these temptations would spell disaster for the children individually and the quest collectively. I recall vividly the day I learned what that “other name” was. Still a child, I was reading though the series (yet again) when my pastor mentioned the series was written by the most popular Christian writer of the early 20th century. The novels, he said, deliberately incorporated Christian symbolism. To be honest, I felt cheated—like an unnecessarily adult, churchly seriousness was encroaching on my childhood joys. Later, I began seeing how the knowledge of Aslan’s “other name” did not diminish the stories but rather made them richer than I had ever realized. It increased childlike joy rather than replaced it. The film adaptation of The Voyage of the Dawn Treader is well worth seeing whether you are still a child, are entering your second childhood, or (like me) never really grew up! It is an adventure story any one can appreciate, Christian or not. But for the faithful, echoes of the “Deep Magic” of Narnia are sure to make the film much more enjoyable and much more meaningful. Mathew Block is a freelance writer in Regina, Saskatchewan and a member of Good Shepherd Lutheran Church. He blogs at www.captainthin.net .